Due to its great boom and the enormous number of users Instagram has, this social network has served to promote trends of all kinds, especially in the field of cosmetics and personal hygiene. This is one of the sectors where there is more innovation, creating new fashions every few years, some of these are very interesting. Among the most current trends that we can find in Instagram, are feather-type eyebrows, these have become famous in a very short time thanks to the hashtag #FeatherBrow. This trend was created by the make-up expert Stella Sironen, who has achieved great recognition in Europe, especially in Finland, her country of origin. However, Stella Sironen never anticipated the great impact her creation would have, since she posted a feather eyebrow image on her account, explaining that it was an emerging trend, but in reality this publication was made as a kind of joke. However, many users were attracted to it and the image quickly became viral. 1 How did feather eyebrow fashion begin? How did feather eyebrow fashion begin? Shortly after this professional make-up artist uploaded an image of feather eyebrows to Instagram saying that she would start using them daily, many users with a significant number of followers began using them and uploading photos related to this type of makeup; one of them was Kelsee Marie. Other make-up artists, such as Kacy Wilkins, also began to use this “false fashion” with great pride, explaining that it is an ideal trend for closed-minded people to try new and different ideas that make them escape from the routine. However, this trend tends to be more prevalent among young people. One of the most striking aspects is that it gives the possibility of creating completely different new shapes by combining different styles and elements of different make-up, something that has never been seen before. Thus, people can look much more original without as much effort or spending a lot of money. Even many professional make-up artists are very attracted by this tendency of Instagram, because as Samantha Marie explains, the most original and eccentric tendencies tend to be the best because they break with established patterns, offering new possibilities for all people who want to look really different. Another reason why feather-type eyebrows have become so popular is the disparity of opinions it has generated in Instagram app users. 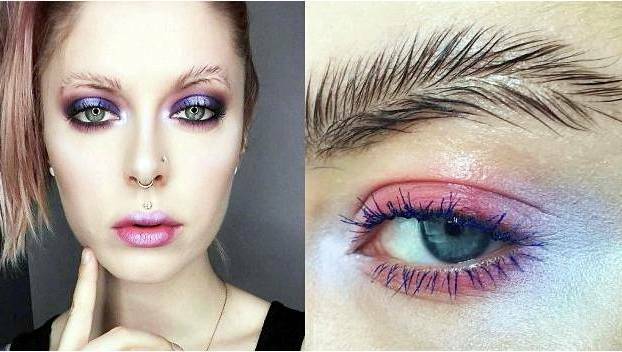 This is because there are a large number of people who think that feather eyebrows are bad taste, while other people think it is a very innovative invention and want to make this makeup. Bonus: This wasn’t going to be everything! We are not going to leave without leaving with a fantastic video tutorial that you can learn how to make up your eyebrows in the shape of a feather. Enjoy it! What do you think? Do you like feather eyebrows? Would you get them done? You know we love hearing your opinion!